Searching for dependable McLean lawn service? Try the professionals at Complete Lawn Service, Inc.…the family owned and operated company that has been providing top notch landscaping services to northern Virginia residents and businesses for over 35 years. 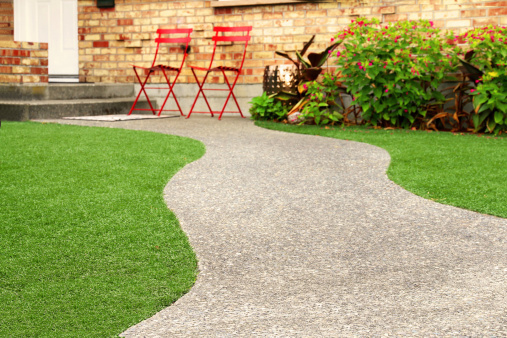 Our team of knowledgeable and experienced professionals use the highest quality materials to beautify your outdoor space and add value to your property. Lawn Care. Complete Lawn does mowing and edging on a weekly basis, which includes grass bagging and recycling and changing directions when terrain permits. Our seeding and feeding programs maintain a high-quality soil and keeps weeds and insects under control. And we offer shrub and bed care that includes maintaining your shrubberies and flower beds year-round. Landscaping. Our landscaping designs combine both beauty and function, with healthy plants and shrubs set up uniquely for your space. Our hardscapes include carefully planned patios, walkways, driveways and retaining walls, and drainage services to reduce flooding. Irrigation systems. Complete Lawn employs a Certified Irrigation Designer that can review your outdoor space, determine irrigation zones, and design a sprinkler system that will effectively irrigate your lawn automatically without wasting water. Once installed, we provide year-round maintenance, and can overhaul your system if needed. Mosquito control. We use a natural and environmentally friendly spray that allows you to use the property afterwards. We do a perimeter spray around your property including under decks to keep those pesky northern Virginia mosquitoes away from your property. Snow removal. Yes, we do that too…our team has plows and shovels on the ready when your home is buried in that white blanket. For more information on how Complete Lawn provides dependable McLean lawn service, have a look at the multiple tabs on this website and see just how we can provide a full suite of services for your outdoor space. And when you’re ready to beautify your property, call us at (703) 560-5296 (LAWN) or e-mail us for a complimentary consultation today!